snowdeal.org > ex machina: the eric update - day 1106: almost a super special third birthday. 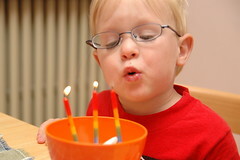 the eric update - day 1106: almost a super special third birthday. no, certainly you didn't forget that july 4th is odin's third birthday! he certainly knows the special day is coming up has been known to tell random strangers that his birthday is fast approaching as he holds up three fingers while telling them that he's going to be "treeeee!" we're all obviously very excited and even took the opportunity to have a little celebration while a special grandma visited before we take a trek to the u.p. to celebrate once again on his birthday proper with a gaggle of cousins and aunts and uncles and grandparents. we'll be on the road tomorrow, but i'm sure sooner or later you'll see a photo or two of one very happy three year old hanging out with some of his very favoritest peeps. and if all goes well, after three years he'll even get to stay up and see some fireworks. HAPPY (late) BIRTHDAY, BIG GUY!